Harmony-rich melodic pop, with influences from the great surf and rock n' roll artists of the sixties. Like a sixties girl group with a modern edge. It all started on August 9, 2006 when Laurie was riding the train home from work. A song that she had never heard before was playing over and over in her mind. She had grown up always having new songs playing in her mind, but never as strong as this one. What made this so special was that she could hear the words and music simultaneously in her head, and the song just wouldn't go away. She went home and saved the melody in the memory banks of one of her keyboards, and quickly typed up the lyrics on the computer. That weekend she decided that this song really should be recorded, and went out and bought some recording equipment and software. That song was "Away on a Cloud", and within a few months of posting it on the internet, she was receiving requests from radio shows to play it on the air. That started the ball rolling and she has been writing and recording ever since. The radio airplay has expanded as well to over 100 stations around the world (standard radio, internet, and podcasts). Laurie started playing piano by ear at age 5. Her music can be described as melodic harmony pop with a heavy 60's influence. Her music has been described as "the Carpenters meet the Beach Boys, with some Monkees and Mamas & Papas thrown in". Laurie is a one-woman production, with all songs written, performed and recorded by her. Great album. Laurie clearly has a natural talent for writing instantly memorable tunes & arranging great vocal harmonies. The songs have the joy and innocence of early Brian Wilson compositions that are given maturity by Laurie's vocals. As mentioned below there is a definite air of Karen Carpenter. But Laurie's great flair for pop also brings to mind female greats like Carol King and Jackie De Shannon. Laurie's clear voice is reminiscent of Karen Carpenter. Her "sound" is a delightful mix of harmonies and catchy lyrics. But don't take MY word for it, give her tracks a listen to the left. You will be GLAD you did! 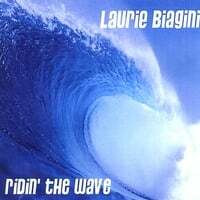 Laurie happily surprised me with her new take on the traditonal surf music. She adds other music flavors here as well. She has a great ear for the right sound. I hope to see her make more albums in the future.